As we discussed in this blog post, the next major phase of our preparations to open a member-owned grocery store will be our member loan campaign. Co-op members will have an opportunity to earn interest up to 6% while investing in their own community! We will be seeking member loans for about half of the $3.6 million in capital we’ll need to raise before we open our store. Today “crowdfunding” has become popular, but food co-ops have been offering this kind of opportunity to their members for decades. Food Co-op members and supporters learned about some of the details of our upcoming member loan campaign, and the benefits of lending to their own co-op, at an informative event held Oct. 21 at the Fredericksburg Library. Ben Sandel of CDS Consulting Co-op talked to our audience about why member loans are important, and why they can be a “win-win” solution for both co-ops and lenders. Member loans allow co-op members to earn interest on this investment in their own community while providing the co-op with funding that is typically less costly and more flexible than traditional bank financing. This can allow co-ops to launch faster. Remember, in contrast to investor-owned corporations, co-ops keep ownership only within their membership, so they do not raise capital by issuing common stock to outside investors, as that would shift control of the co-op away from members. 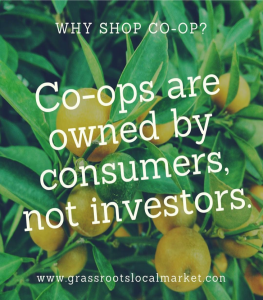 Co-ops exist to provide a specific, desired service to member-owners, not to return profits to non-member investors. Member loans are a primary way that co-ops raise capital, while keeping control with members. For co-ops, raising funds among members builds loyalty among these co-op owners that will eventually make the co-op-run grocery store more sustainable. For members who decide to lend to the co-op, investing in a co-op member loan offers a unique opportunity that is not tied to the volatility of the overall stock market. It very literally moves money from Wall Street to Main Street, where it can make tangible things happen within your own community. This is an opportunity to invest in an organization whose values you fully understand and actually have a say in. We will be seeking loans of $2,000 and up. Members will be able to earn interest up to 6% depending on the amount invested. At this time, we are preparing the documents necessary to formally launch this loan campaign sometime around March-April 2019. But we will be prepared to share information with interested members sooner. So please contact us if you wish to learn more. As you approach a season of end-of-year financial planning, we hope you’ll keep in mind this opportunity to play an important role in the launch of the Fredericksburg Food Co-op.